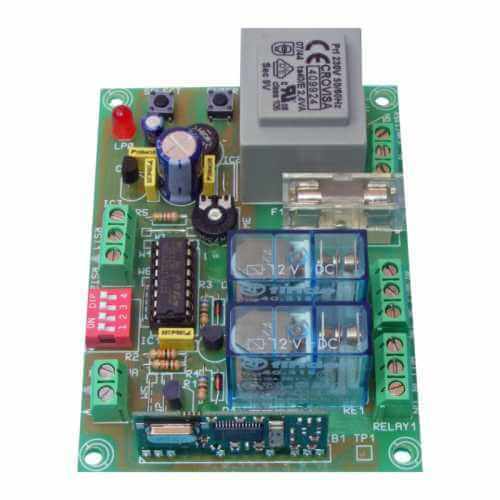 The Cebek TL-613 is a highly flexible 2-Channel 230Vac mains powered Momentary, Toggling/Latching or Delay Timer RF relay receiver module. TIMER MODE: relay activates for a user adjustable on-time of between 0.1 and 132 Seconds. Timer is a non-cumulative retriggerable type. Any further button presses made while the timer is active will restore the full delay time (non-cumulative) without interrupting the relay. If no new triggers are received before the delay timeout is reached, the relay will turn off and the channel reset ready for a new trigger signal. Reset Inputs: each channel has a reset input to immediately turn off (or disable) the corresponding relay output (all operating modes). Connect to volt-free contact closure like a switch, manual over-ride button, etc. All channels are disabled if any of the reset inputs remain closed. From our Group 3 range of 433.92MHz RF remote control modules - mix and match from a variety of receiver and transmitter options to suit your needs (see compatibility table below). Up to 5 Group 3 transmitters can be learnt by a receiver. Other unlearnt transmitters within range will be ignored.